I was newly religious, newly married, and a new immigrant to Israel. I was also a new student in a brand new Masters Program at Hebrew University. It was 1996, during the months of religious-secular tension following Rabin’s assassination by an Orthodox Jew, and for a hat-wearing woman like me, Hebrew University felt like a minefield. And through it all, Rakefet, the only other religious woman in our program, was my inspiration. Rakefet had grown up in a religious home, and didn’t feel even a smidgen uncomfortable or self conscious (as I did on a constant basis) about being a religious Jew at a secular university. She had a career she enjoyed, was the wife of a successful lawyer, and loved being a mother to her 6 children. Rakefet in four words? Warmth, light, beauty, dignity. I graduated from the MA program, and parted ways with Rakefet for many years. Until I ran into her one day a few years ago. Rakefet was as gorgeous as ever, with her olive green eyes and classy matching felt hat. But something was different about her. When we had studied together, Rakefet had shined like a chandelier. And now? She looked like the Electricity Company had shut off the lights. “Jenny, you heard, of course, that my oldest son who was killed in the army 3 years ago.” Rakefet said. “How awful, what a nightmare!” I cried in my heart…But something was off. Rakefet and I had not been in touch for so many years. How would I have heard about her son? Rakefet and I said “good bye,” and I have not seen her since. But this morning, as the Memorial Day siren sounded throughout Israel, I imagined that the siren was Rakefet’s scream. The primal scream of a mother who lost her son, who lost her husband, who lost her life. And she doesn’t let out that scream only on Memorial Day. She screams that scream every moment of every day that she mourns her son and her life that are no longer. It is a regular morning. The bright Israeli sun enters my eyes and wakes me up. I wash my hands and brush my teeth and get dressed and live my Israeli dream come true: raising this family in this home in this supremely Holy Land. And there is not a day that passes that I don’t feel thankful for the fact that I can live here. After 2000 years of my ancestors praying to live in Jerusalem, I do. 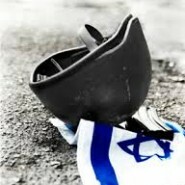 My life is Israeli Independence Day. And none of this would be possible, none of it, without the heroism of Rakefet’s son, of blessed memory, who died fighting the enemies who want to drive me and my family and every single Jew from our Land. And none of this would be possible without the mourning of a bereaved father and the grief of brothers and sisters and friends. And none of this would be possible without a broken mother named Rakefet for whom every day, every single day, is Israeli Memorial Day. my uncle, yitzchak ben eliezer zilberman OBM, died at the age of 19 during Israel’s War of Independence in 1948. he was lost in the first battle of Latrun. it took almost a year before my grandparents were told that he had definitely died, altho they could not identify his body among the others, and is buried in a communal grave. His death definitely shattered my grandparents’ marriage, but they stayed together until my grandfather died in 1987. my grandmother died in 1999, at almost 95 years old. and there wasn’t a single day that she did not actively miss and mourn her son. he died before he had a chance to marry, to have children, to be…. i was raised with his ghost, always wondering what life would have been like had he lived. the loss of the generations from that branch of my family is countless. but i have always been comforted by the thought that by giving his life, countless others have been zoche to live in our land as free Jews. we can count those generations as his descendants. i believe it would give her some comfort if you would connect with her and let her know how grateful you (and all of us as well) are for being able to live in this land because of the tragic sacrifices that her family paid and still pays today. she could use that verbal hug and maybe a physical hug too. may we be zoche TODAY to be reunited with our loved ones with the Geula Shleima and rejoice together in Yerushalayim Habenuya! A very moving piece of writing.